Kid's security is something every parent worries about. But in most cases, incidences of kidnapping and child getting lost happens when they have to live the house to go and play somewhere in the neighborhood. With this in mind, parents should think of ways to control their child's movement and having kids’ playsets installed in your backyard may just be the right decision you make this year. As much as you want your child to enjoy being a child, safety and security are key issues you have to worry about. 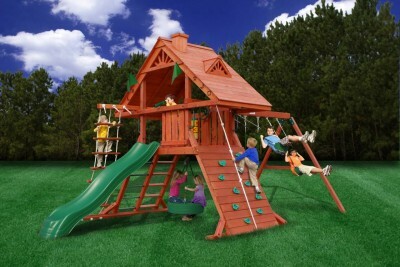 Play sets come in a variety of sizes, types and colors. You can invest in indoor or outdoor play sets made from a wide variety of materials. Play sets holds a unique place in the world of toys and in the hearts of children. The concept of imagination develops in kids as they play in a detailed and scaled environment. In their minds, the different play sets they have can assume the form of real life house, vehicle, jungle, alien location or playground on which they can have fun on. thus with many models of play sets to choose from, you should not be worried what kind of playground equipment you will be getting for your child this year. Despite fitting in your budget, you can get some really sophisticated play equipment designed to your needs. Kids’ playsets benefits both the parents and the children. For instance, it will get the children outside to play. Running around, and playing together adds up as an effective exercise for your child. Outdoor kids playsets inspire activity and activity leads to imagination and creativeness which are key areas in child development. For parents, having backyard playground will keep the child at home and reduce the chances of them wondering off under unsecured circumstances. Your home value will also improve once you install playground equipment. Play is addictive and it does not matter if your child is requires accessible playgrounds for them to play, as a parent and caregiver, providing the right platform for playing is all you need to do. Leave the rest to the young minds.